Update (02 Feb 2019): Firstly, a list of stamps being issued in 2019 can now be found at the end of this post. I will keep adding new releases down below. The year began with the stamp release on CIPET Golden Jubilee by the Vice President of India at an event in Chennai (24th Jan). The stamp was very poorly designed, and is actually worse than the one on BRBRAITT (April 2017). MoS Communications dedicated the stamp on Mahamati Prannath the very next day in New Delhi. Prannath Ji was a spiritual leader in the 17th century. King Chhatrasal of Bundelkhand was among his followers. His 400th birth anniversary was celebrated in October 2018 and I'm assuming due to excessive number of stamp issues last year, this was moved out to this year. I'd have liked to see a full color image on the stamp, similar to the one on Sant Eknath (2003), but the designer chose muted pastel colors instead. The next two stamp issues provided much needed relief. Satish Gujral, a well known contemporary artist designed a stamp on Financial inclusion, which was issued by MoS Communications and the Finance Minster in the presence of Mr. Gujral on 30th Jan to celebrate 2 years of the launch of India Post Payments Bank. The stamp shows the artists' take on digital payments, and a postman delivering mail. It was a nice change from the mundane artwork of several artist that have been working with India Post for many decades. Soon after, on 2nd Feb, MoS Communications dedicated another stamp, this time on the on-going Kumbh Mela in Prayagraj. I'm yet to confirm this, but the stamp was likely designed by Kamleshwar Singh and shows several aspects of the mega religious gathering like bathing in the holy Ganga, tent city, a pontoon bridge, a railway/road bridge, pilgrims and temples. I'm hoping all of the future stamp issues will have artists use such detailed research, original artwork and thoroughness. Commemorative stamps have been approved on Aero India 2019 (air show and expo in Bengaluru) and Professor Ram Chand Paul. I had informed collectors about the stamp on Paul in early December on Twitter. Somehow the stamp on Republic Day on nonviolence theme was not issued, and there's no clarity on the issue date. A customized MyStamp sheetlet was also issued by the Jharkhand government in mid-January showing Sohrai, a winter harvest and cattle festival. Update (19 Jan 2019): Some stamp issues are lining up for issuance in January. The first one appears to be on 50 Years of Central Institute of Plastics Engineering and Technology to be released on 24th January. It will be a Rs 41 stamp in sheets and miniature sheet formats. Next day, 25th January will see the stamp on Mahamati Prannath being released. It's likely the Republic Day crowdsourced stamps will be issued soon after as well. I've included the following stamp subjects in the list below: Children's Day, Independence Day and Republic Day. Will there be a stamp on Kastruba Gandhi's 75th death anniversary in February? Original Post (15 January 2019): Just beginning to build out the list of approved stamp subjects for the new year. It appears than India Post is continuing to use stamp subjects that were approved a couple of years back, especially the non-personality ones to plan new released. I actually don't mind this approach because it doesn't throw many surprises and relegate approved issues to the back burner. I know several stamp designers have been working on these remaining stamp subjects, so let's hope these come to light. On the other hand, stamps on personalities have been added as the years have gone by, with no particular bias toward the ruling federal government. It has generally been an even distribution for various states and types of personalities. I've seen some social media posts with a definitive stamp on Atal Bihari Vajpayee (Rupees 2) being sold in some post offices. This is a welcome move. The stamp was possibly released on 25th December 2018, but that's yet to be confirmed. Do share your thoughts about stamp subjects and releases for 2019. Happy New Year! Click on the images below to enlarge and right click to save. Update (23 Jan 2019): Details for India Post stamp issues from October to December 2018 was slow to trickle in, but it appears that design and printing information is now available. Print quantity for most of the stamp issues were increased to about 0.5 million, and only a couple of them were printed in smaller quantities (0.3 million). Stocks for all the stamp issues were generally available in the post offices, except some major delays from the printer (SPP, Hyderabad). India Post appears to have realized this issue late in the year and started indenting some issues with ISP Nashik as well. I truly hope CSP Kanpur and EPP/MSP Chennai, two private printers that supplied postal stamps until 2014, will be used again. It will not only improve supplies to post offices, but will improve paper and print quality and security features as well. Both these printers have superior printing equipment than the government presses. MyStamp lists with most of the print quantities are listed below as well. I've tried to verify the print quantity and designer info, but do let me know if there are any errors. I'll be happy to update. Update (14 Oct 2018): I've finally managed to get around posting details for commemorative stamps and MyStamps issued by India Post from January until September. India Post's philately department was posting regular updates on social media until March this year and has gone completely missing since then and that has made finding print quantities and stamp artist information much difficult. Information brochures don't reach post offices in time to gather this either. 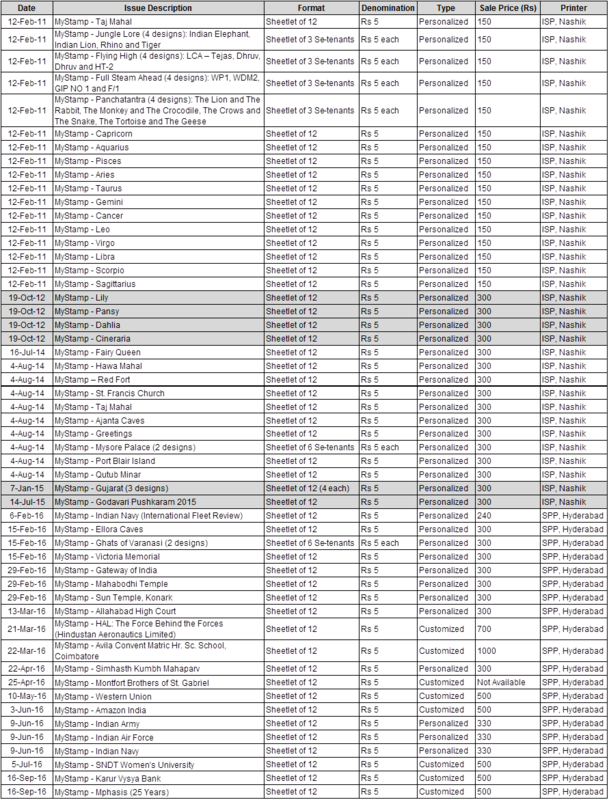 Anyways, the tables below cover most of the year, but I will likely add a couple more updates, depending on the number of stamp issues in the last quarter of this year. Until then, enjoy. 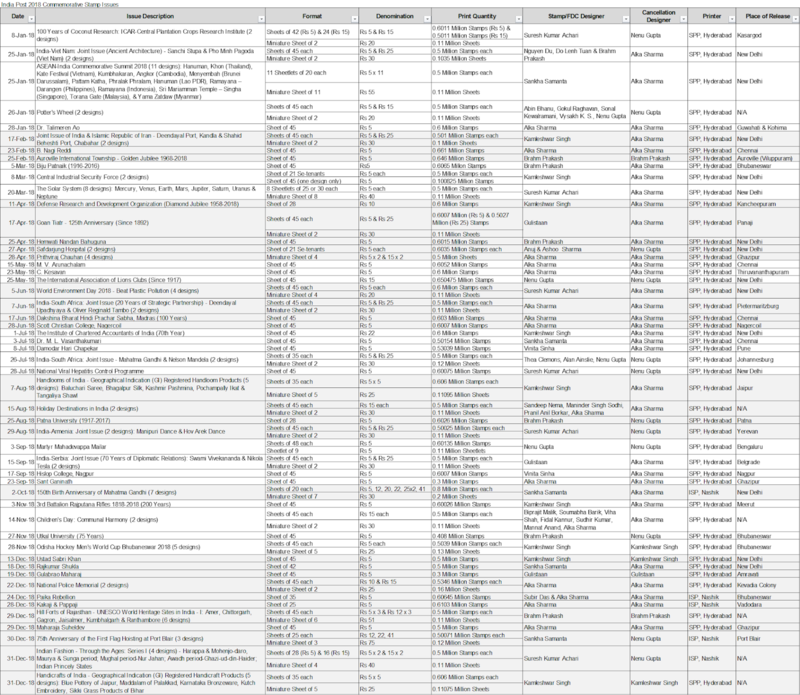 Update (20 Jan 2019): It had been a while since I'd updated this post, especially total number of India Post stamps etc from 2017 were still pending. Given the massive number of stamps and philatelic products, I was somewhat unsure about categorizing some of the stamps. The tally is finally complete, including last year, which was another blockbuster with 117 commemorative stamps. I've further expanded the MyStamp list to split personalize and customized/corporate MyStamp sheetlets. These products have been evolving over the last few years, and I thought it best to separate the two. If there's any confusion or clarification needed, please let me know in the comments below. Hope this list helps shed some light on the trends in India philately. Update (06 Feb 2017): Here's an update to the count of total commemorative/MyStamps, which now includes totals from 2016 as well. There was a huge increase in the cost of stamps and sheetlets issued last year along with the introduction of customized MyStamps sheetlets. Do check lists of se-tenant stamps and MyStamps for further details. 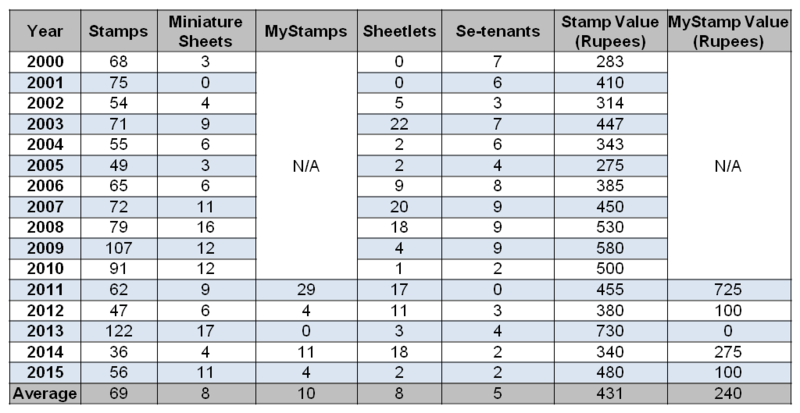 Update (15 May 2016): Given that so many MyStamp sheetlets have been released in 2016, it was considered prudent to separate MyStamp sheetlets. Pricing for MyStamps are not fixed so, the lowest known price will be included going forward. 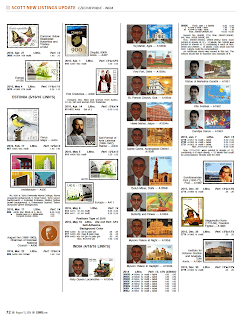 Original Post (29 Jan 2016): Here's a count of commemorative and special postage stamps issues by India Post from 2000 to 2015. For the reader's reference the list also shows face value of the stamps. If there are errors in the list below, just leave a comment. 1. Definitive stamps are not included. 2. MyStamps have all been issued in Sheetlet format and are included in the Sheetlet count. Each MyStamp is valued at Rs 25 because that appears to be the most common retail price for these personalized/customized stamps. 3. Each se-tenant stamp issue is counted only once (even if multiple se-tenants can be formed from a given issue). For e.g. Social & Political leaders stamp from 2000 was available in strip and block se-tenant formats, but is only counted as one. 4. Souvenir sheets and Siamese Twin issues are included in Miniature sheets as well. 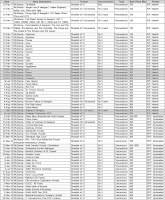 Update (20 Jan 2019): Just wanted to update the se-tenant list of stamps to include issues from 2018. There were much fewer se-tenant stamp issues last year when compared with 2017. Two se-tenant commemorative stamps, one souvenir sheet (se-tenant of 4) and two MyStamp sheetlets with se-tenants were issued throughout the year. Update (21 Jan 2018): I've got around to update this list as well. Last year (2017) was so huge, but this list was relatively easily compiled. There were 11 true se-tenant issues, majority of them issued as miniature sheets only. There were no separate fill panes for these stamps and thus they were considered as se-tenant stamps. Two stamps, Deekshabhoomi of Dr. B. R. Ambedkar and Banaras Hindu University were the only issues that were issued as se-tenant full sheets. Overall, it was a good year for se-tenant stamp collectors. Do check the formatting rules for the table below in the previous update. Update (07 Jan 2017): An updated list of se-tenant stamps of India from 1974-2016 is being posted here. 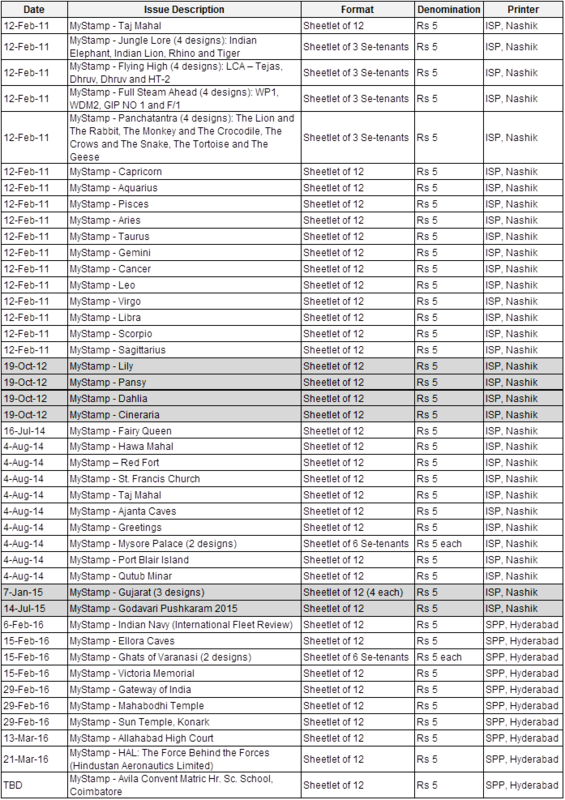 This list should serve as a basic reference for se-tenant stamp issues for Republic of India stamp collectors. Specialized se-tenant collections will need additional details, but that's beyond the scope of this blog post. A few minor changes have been made to the format of the list as well. The list is separated in a few sub-sections by the year of stamp issuance, 1970-1989 is divided by each decade (1970s, 1980s etc) and then year-wise from 1990 onward. 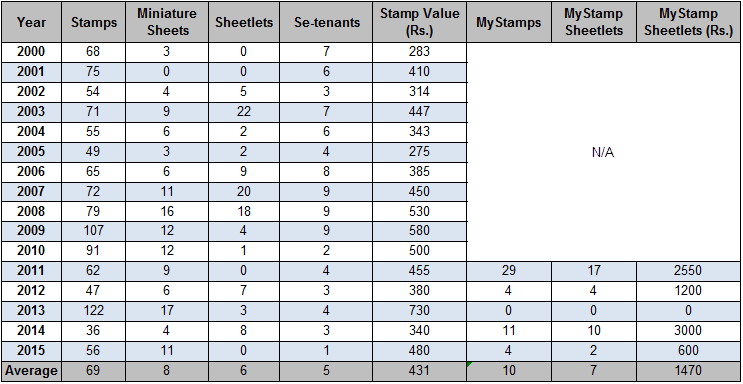 A quick break down for the 'format' column: Se-tenant implies a pair of 2 stamps, Se-tenant of 3 or higher could be in different formats such as vertical or horizontal strips, blocks etc. All care has been taken to provide accurate information, but as always, if there are any errors, just leave a comment and it will be fixed. A list of se-tenant stamps of India from 1974-2015 is posted here. 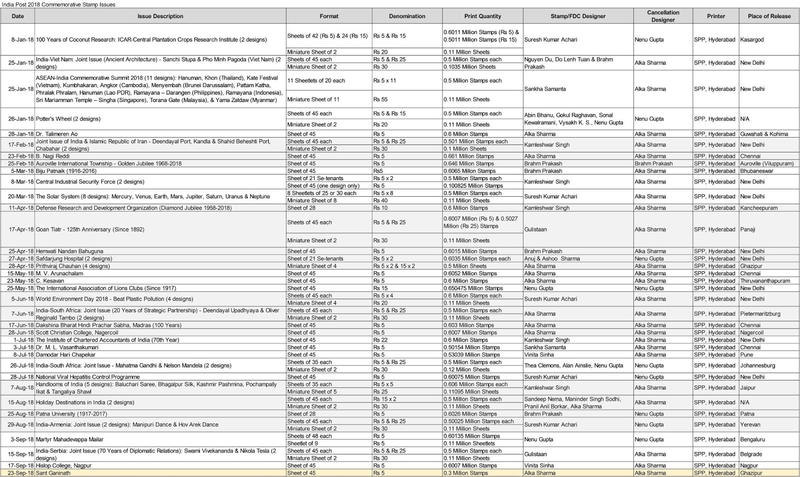 This list should serve as a basic reference for se-tenant stamp issues for Republic of India stamp collectors. Specialized se-tenant collections will need additional details, but that's beyond the scope of this blog post. The list is separated in two main sections: 1970 to 2000 is divided by each decade (1970s, 1980s etc) and then year-wise from 2000 onward. A quick break down for the 'format' column: Se-tenant implies a pair of 2 stamps, Se-tenant of 3 or higher could be in different formats such as vertical or horizontal strips, blocks etc. All care has been taken to provide accurate information, but as always, if there are any errors, just leave a comment and it will be fixed.The total number of se-tenants should also correspond to the list in another post. Update (20 Jan 2019): It's time for another update to the MyStamp listing. 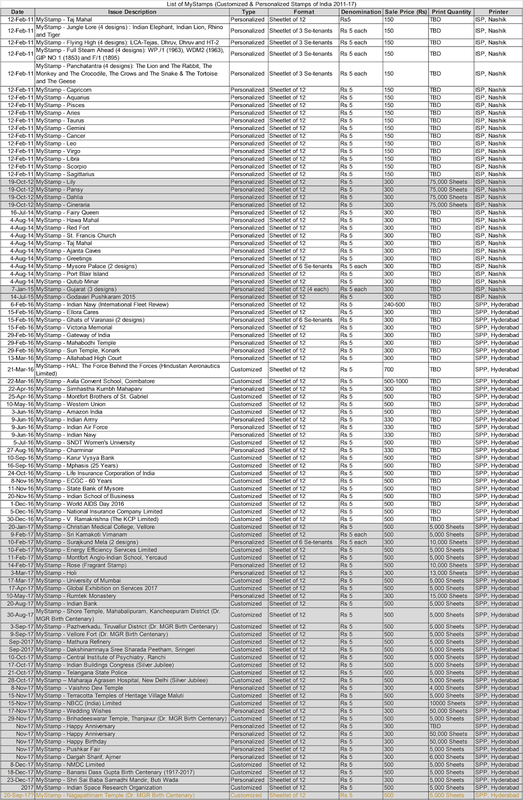 In addition to listing all issues from 2018, I've been able to find print quantities for several more sheetlets. Like 2017, a large number of customized/corporate MyStamps were printed by India Post last year as well. This trend appears to continue even in 2019, but given the exorbitant cost to complete this collection, and Scott Catalog not listing the customized stamps, I'm not sure about purchasing all sheetlets this year. It would be best if India Post could make single MyStamp sets available for collectors. The Indian Journal of Ophthalmology MyStamp printed in 2017 is still nowhere to be seen and I haven't heard anything about its availability so far. Let me know if you'd like to see any other details or want to share other MyStamp information with fellow collectors. Update (28 Jan 2018): Two things I should have pointed out earlier - one for the LIC MyStamp and another for Indian Journal of Ophthalmology MyStamps. The MyStamp on Life Insurance Corporation of India was released in 2016, but I've recently learned that LIC may have ordered another print of 8000 sheets in 2017. I will confirm this soon, but this is likely to have happened. The second mention is for the IJO MyStamp, which was printed in 2017, but never issued by the proponent. Given that the stamp has not been made available for purchase or no release event has occurred, I may wait until 2018 or later to include on the list of MyStamps. That's all. There are new MyStamp sheetlets already being released, but that discussion is for a later date. 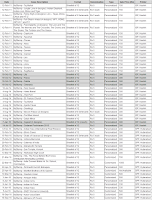 Update (21 Jan 2018): Given that most of the MyStamp issues from 2017 are known now, I've updated the list below. This past year saw further increase in the total number of MyStamp sheetlets put out by India Post, albeit one less personalized sheet when compared with 2016. Before I go further about some new things about the MyStamp issues from last year, let me make it clear that these are new and valid postal stamps and are likely to be part of a complete Republic of India collection. India Post is ripping off collectors by selling the sheets at such high premium. Now, for some new observations from 2017. The personalized sheet on Rose (issued on Valentines Day) had a floral fragrance embedded on the sheets, which was the first time on a MyStamp sheet. In order to celebrate Dr. MGR's birth centenary, Tamil Nadu state government ordered customized sheetlets for 4-5 events in various districts. The main stamps show monuments from these districts, but the blank label has an image of MGR. A complete collection of these sheets will be a good item for MGR fans. Yet another personality, second one after V. Ramakrishna in 2016, Banarsi Dass Gupta was depicted on a customized MyStamp sheet. Last point is about the design of MyStamps. Majority of these stamps were decently designed, but the Wedding wishes, Happy anniversary and Happy birthday stamps needed more thought than just printing in different fonts. I've started to collect data for print quantity of these stamps, which you can see below. If there is anything else that you'd like to share, let me know in the comments below. Update (07 Jan 2017): The updated list of MyStamps for covering all of 2016 is posted below. In the last quarter of 2016, seven new MyStamp sheetlets were put for sale. Among them was the first MyStamp on a personality (V. Ramakrishna of KCP Limited, Chennai). Majority of the rest were corporate institutions, barring the one on World AIDS Day 2016. The MyStamp on ECGC and Indian School of Business was released by the President of India, the one on World AIDS Day 2016 by the Health Minister of India, V. Ramakrishna by the Urban Development Minister of India, National Insurance Company and State Bank of Mysore by the respective companies' leadership. The cost of collecting one sheetlet of each kind in 2016 exceeded Rs 10,000 and will likely deter stamp collectors from purchasing these stamps if the cost and number of issues remain similarly high in 2017. Let's wait and see what the cataloging companies list for these new MyStamps. 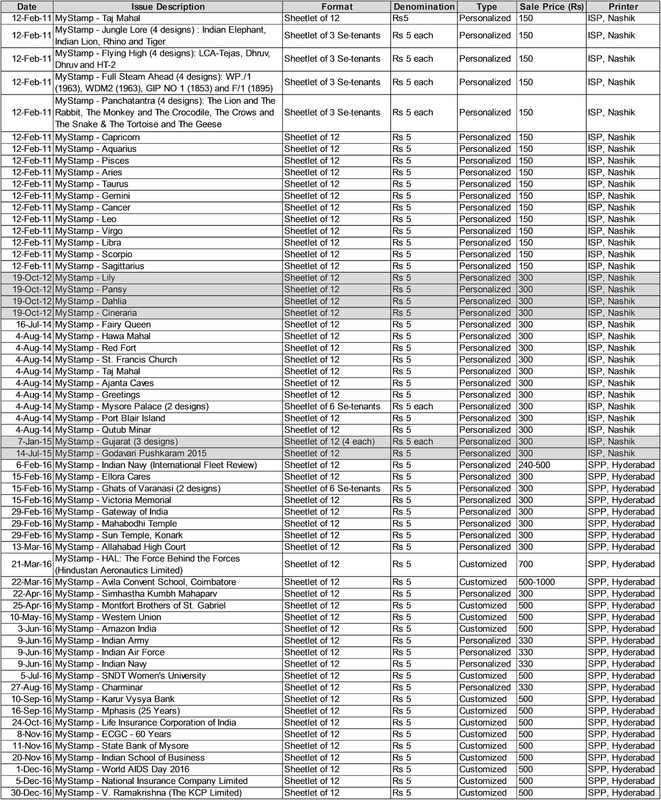 Update (25 Sep 2016): Quite a few MyStamp sheetlets have been issued in the last few months. Most of these stamps have been made available for purchase on ePostOffice. Prices for these sheetlets vary between Rs 300 and Rs 1000, with most of the customized sheets being sold for Rs 500. The list below is now being categorized as Personalized and Customized along with the known sale price. Curiously, the Western Union MyStamp was released in May 2016, but not made available for sale until July and the design on the sheetlet being sold is different from what was published in news articles back in May. Customized MyStamps are here to stay. In reply to a question in Lok Sabha, MoS Communications informed the house that this was a planned scheme introduced by India Post to allow corporate and educational institutions to order a minimum of 5000 MyStamp sheetlets with a logo or design of their choice. No wonder a spate of customized sheetlets have been released this year. Collecting MyStamp sheetlets is indeed an expensive affair, so hopefully collectors can buy individual MyStamps from the secondary market to complete their collections. Linn's that publishes the Scott catalog has listed MyStamps with catalog numbers. 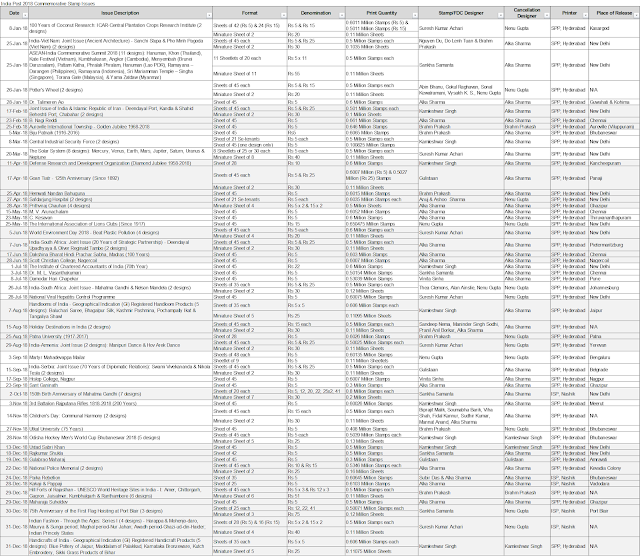 See below for the catalog numbers. Update (26 Mar 2016): MyStamps have all been issued in sheetlet format. Some of the sheetlets contain more than one design as well, forming se-tenants of 2 or 4. 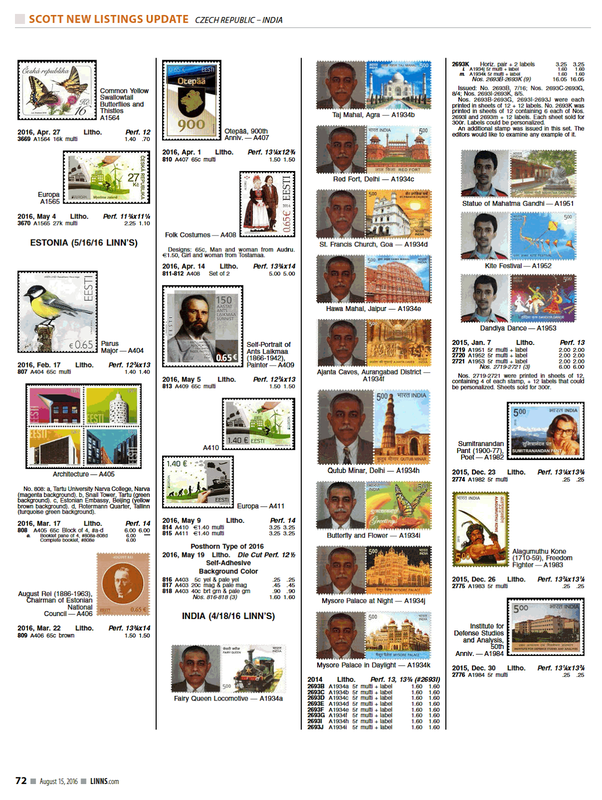 Each of the MyStamps released so far have been in Rs 5 denomination. MyStamps are sold as complete sheetlets only, individual stamp are not sold by the post office. Price of each sheetlet ranges from Rs 240 to Rs 300, rendering cost of each stamp to be between Rs 20 and Rs 25. Most of these stamps released after 2012 have been made available only in the relevant postal circles. For e.g. Ajanta Caves (2014) sheetlets were available only in Mumbai Maharashtra Circle, Red Fort (2014) in Delhi Circle and so on. This poses a challenge for philatelists to complete their Republic India collection. Now that ePostOffice is working well, it would be ideal to put up these sheetlets for sale online making it much easier to purchase MyStamps. On a different note: Although, the Avila Convent, Coimbatore MyStamp release was delayed from 21 Mar, it was issued the very next day on 22 Mar 2016, by the Postmaster General and Jagat Shah (Mentor on Road) in Coimbatore. The school is selling the sheetlet in two different packs for Rs 1000 and Rs 2000. Similar to the recent Hindustan Aeronautics MyStamp sheetlet, this is also a customized stamp sheetlet and surprisingly contains Avila's email and website as well. This approach of issuing customized MyStamps can be clearly seen to be going the Customized Greeting Card route that India Post had ventured in the early 2000s. Given that the MyStamps are actual stamp and not just pre-paid envelopes, it is important for India Post to restrict the total number of such customized postage stamps being released in a year. It is highly recommended that these stamps be made available to a stamp collectors at a minimum price and online. Original Post: By now all philatelists with interest in Republic of India (Post-independence) stamps would be aware of MyStamps that India Post has been issuing since early 2011. The first set of stamps were released during the Indepex 2011 International Stamp Exhibition held in February 2011 in New Delhi. After success at this premier stamp show, other regional stamp exhibitions asked for the same stamps to be distributed in other cities as well. Since 2012, other philatelic events and even philatelic bureau have been providing there personalized or customized stamp sheetlets for collectors. MyStamps have blank space next to an official India Post stamp. The post office upon submission of a photograph prints the image in the empty column of stamps on the sheet of MyStamps. Initially, it was unclear whether the MyStamp themes were modifications to previous issues or were new stamp releases. Over the last few years, it has become clear that one needs to collect MyStamps in order to have a complete collection of Republic India stamps. Below is a list of MyStamps issued by India Post. Recently, the first customized MyStamp sheetlet was released to celebrate 75 years of Hindustan Aeronautics Limited (HAL). Original Post (04 Oct 2018): This post will be a source to aggregate stamp subject suggestions or ideas that India Post can use to design stamp programs for future years. I have posted some of this information in couple of other posts and on the twitter feed as well. The list is simply organized by year, and separately lists some other personalities, events and themes that I'd like to see being issued as postal stamps. Feel free to leave your ideas in the comments section below. When I make modifications, those will all be mentioned at the bottom of this post.